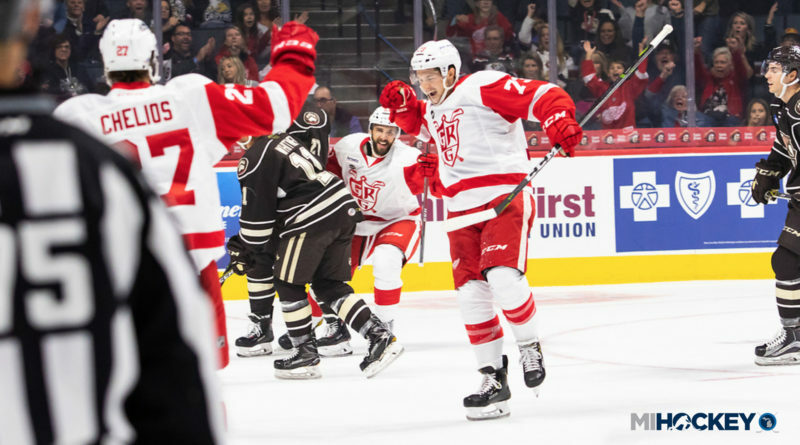 The Griffins controlled their own destiny Saturday night, but they ended up needing some help from others to secure a spot in the AHL postseason. Despite the Griffins falling 5-0 to the Milwaukee Admirals, the Wolves beat the Manitoba Moose, which was one of the more nerve-wracking clinching scenarios for Grand Rapids. The Griffins do not know who they will face in the first round – there’s still games to be played today – but they do know that they will be extending their franchise-best consecutive playoff appearances to seven. The best-of-five Central Division semifinal match-ups will be decided after a Milwaukee vs. Rockford Sunday contest; if the Admirals win, the Griffins play Chicago, while if the the IceHogs win, the Griffins would play the Iowa Wild. Grand Rapids made the final stretch of the regular season as stressful as possible, as they lost all of their last nine contests (eight in regulation). They finish with a 38-27-7-4 record on the season. On a brighter note, Ben Simon is the eighth coach in franchise history to lead the Griffins to a postseason appearance in his first season; he joins Dave Allison (1996-97), Bruce Cassidy (2000-01), Danton Cole (2002-03), Greg Ireland (2005-06) Curt Fraser (2008-09), Jeff Blashill (2012-13) and Todd Nelson (2015-16) on that list.